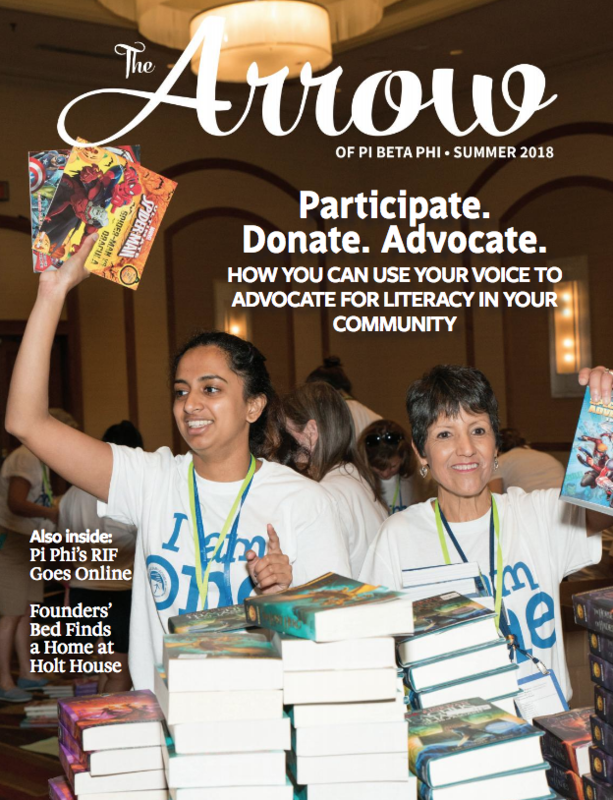 Pi Beta Phi updates Recruitment Information Form process nationally: alumnae can now submit Letters of Recommendation online. Pi Phi officially went digital over the summer and created a means to submit letters of recommendation for incoming rushees electronically. This is a national update. 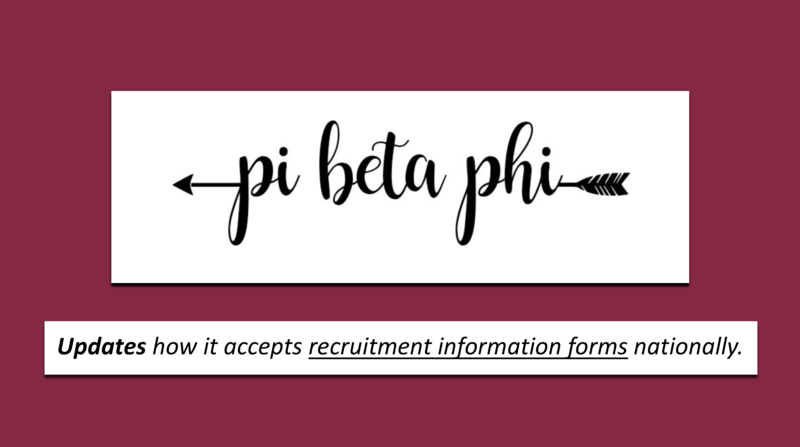 Effective immediately – one can now submit Pi Phi’s PNM recruitment information form /sponsorship form ONLINE without having to print it, fill it out, and mail it to the correct chapter. Let’s take a moment to acknowledge that and celebrate! What does this mean for Pi Phi alumnae? This means it’s easier than ever to submit a recruitment information form and sponsor an incoming PNM. Both old and new versions of the form can be found on the national Pi Beta Phi website. You can view and complete the brand new electronic version of recruitment information form here. Pi Phi has historically called these recruitment information forms (RIFs). They’re also widely known as letters of recommendation, LoRs, rec letters, letters of rec, and sponsorship forms. Whatever you choose to call them – rejoice! They can be submitted electronically now. What does this mean for ladies planning to participate in sorority recruitment? Since Pi Phi alums can now submit letters of recommendation electronically, they will be requesting digital versions of your sorority rush packets. This means ladies planning to participate in recruitment this fall 2019 can send digital sorority rush packets to alumnae vs. physical sorority packets (and should be prepared to do so at the alumnae’s request). If you plan to participate in recruitment this fall, you will need to have these ready! What do you mean by a digital sorority packet? Nothing scary: it just means you’ll need a digital, PDF version of your resume, recruitment photos, and other materials you would have otherwise submitted in your physical sorority packet. It also means that Pi Phi alumnae might not know that submitting letters of recommendation electronically is an option yet. Alumnae might still request physical sorority packets since that’s been the way they’ve done things up until now. Be sure to inform them of the update and feel free to send them this link. They’ll definitely be appreciative to learn there’s an easier way to get these submitted, and you’ll get all the credit for letting them know ;)! This is a game changer; Pi Phi is one of the later NPC sororities to allow for recruitment information forms to be submitted online. They’re the very last of the University of Texas sororities that didn’t previously accept digital recruitment information forms and digital sorority packets. For incoming fall 2019 UT rushees – this means that all of your letters of recommendation, sponsorship forms, and recruitment information (again – all these are just different names that refer to the same form) can be submitted online vs. snail mailed to the sorority houses, and that you can provide your alumnae with digital sorority packets to be attached and submitted electronically alongside these as well. Read this article if you’re a mom looking to help your daughter prepare for sorority recruitment. Read Legacy Status: Does it Help or Hurt Going Through Sorority Recruitment? if you’re a legacy planning to participate in recruitment. Read this page if you’re a PNM (aka an incoming rushee) looking for helpful recruitment tips and sorority-related resources. PNM with questions? Pi Phi alumnae trying to submit a recommendation on behalf of a PNM? Reach out and we’ll walk you through it. Email us at sororityrushcoach@gmail.com or give us a call at (512) 827-7586.